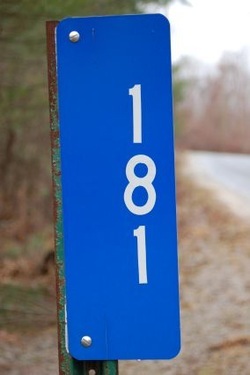 The Winchester Volunteer Fire Department has blue and white reflective house number signs available for sale and installation. The signs are made of aluminum with reflective blue overlay and reflective white numbers. In an emergency, time can be a very important factor for survival. Should you need any emergency services at YOUR residence (Police, Fire or Ambulance), it is crucial for them to quickly and accurately find YOUR house. By installing these house number signs at the end of your driveway, close to the roadway, it makes finding your house much easier and faster, especially at night. The reflective numbers are visible from a distance and allows a driver time to slow and confirm the address. Please, help your emergency responder, family, friends and visitors to your house easily find you. For additional information and an order form, please open the House Number Ordering Form.